In recent seasons Francesco Maria Colombo has returned to the Minnesota Opera to conduct Donizetti’s Roberto Devereux; an opera he also conducted at L’Opéra de Montréal in the 2010-2011 season. Also for L’Opéra de Montréal he conducted Verdi’s Il Trovatore for their 2011-2012 season. In the fall of 2014 he returns to L’opera de Montreal to conduct Verdi’s Nabucco. In the 2009-2010 season Francesco Maria Colombo continued his cycle of 20 concerts with the Orchestra Verdi dedicated to the twentieth century, inaugurating the second series. This was an unprecedented initiative in Italy, because each concert includes an analysis of excerpts with live examples from the orchestra, plus the complete performance. These 20 concerts were broadcasted on Sky TV on its Classica channel. Again with the Orchestra Verdi, Maestro Colombo recorded a CD of music by Victor De Sabata, published by Universal last spring. As soon as it came out, the CD won the Italian music critics’ award announced by the magazine “The Classic Voice” for the “best 2009 debut” section. Among his latest successes may be mentioned the opening of the celebrations for the Haydn bicentenary as conductor of the Orchestra Haydn di Trento e Bolzano and of the Prague Philharmonic Chorus, with a performance of the Trauer-Symphonie and of the Harmonie Messe. In the 2007-2008 season Maestro Colombo toured Asia with renowned soprano Sumi Jo, lead a gala with the Opera Company of North Carolina, and returned as guest conductor for subscription concerts with the Flint Symphony Orchestra. Among the highlights of Maestro Colombo’s 2006-2007 season were performances of Il Trovatore with the Orchestra Sinfonica Giuseppe Verdi in Milano and La Boheme with the Opera Company of North Carolina. He made debuts with the Czech Radio Orchestra and the Buenos Aires Philharmonic, returned to the Associazione Lirica e Concertistica, As.Li.Co., for performances of Il Trovatore in Brescia, Cremona, Como and Pavia, and gave concerts with the Frankfurt Museumsorchester, the Toscanini Orchestra, the Haydn Orchestra, the Pomeriggi Musicali (for Reynaldo Hahn’s Mozart), the Malaga Philharmonic, the Teatro Lirico in Cagliari, and the Teatro Carlo Felice in Genoa. Maestro Colombo’s engagements in 2005-2006 included a return to the Orchestra Verdi in Milan, the Orchestra Haydn in Trento, the Giordano Festival, his return to the Minnesota Opera for Mercadante’s Orazi e Curiazi, and a critically acclaimed subscription concert with the Flint Symphony Orchestra. In 2004-2005 Maestro Colombo led a new production of Lucia di Lammermoor in Thessaloniki, Greece, made his U.S. conducting debut with Maria Padilla for the Minnesota Opera, debuted Tosca with the Opera Company of North Carolina, and led concert performances of Cavalleria Rusticana and Pagliacci in Sicily. His concert activity included performances with the Orchestra Toscanini in Parma, and the Malaga Philarmonic Orchestra in Spain. Sinfonica Siciliana, the Orchestra della Toscana, the Philharmonia Veneta, the Philharmonia Mediterranea and the Choir of the Cappella della Pietà de’ Turchini in Naples, the Teatro Lirico in Cagliari, the Orchestra Haydn in Trento and Bolzano, the Pomeriggi Musicali in Milan, the Orchestra della Magna Grecia, the Accademia dei Filarmonici in Verona, the Bergamo Orchestra Stabile, and the Orchestra di Roma e del Lazio. According to the daily L’eco di Bergamo in 2001 Gian Carlo Menotti “symbolically offered him the baton of Thomas Schippers” with an invitation to conduct the traditional closing concert of the Spoleto Festival. Maestro Colombo led the Orchestra of the Festival and the Choral Arts Society of Washington D.C. in works of Mendelssohn, Tchaikovsky and Borodin for an audience of more than 8,000 and a live radio audience on the RAI. Maestro Colombo returned to the 2002 Spoleto Festival for a new production of Menotti’s The Telephone and The Medium, directed by the composer himself. Maestro Colombo’s operatic engagements in his native Italy have included new productions of Giordano’s Messe Mariano at the Giordano Festival in Baveno, Lake Maggiore, and the first Italian performance of the critical edition of Offenbach’s Les Contes d’Hoffmann for As.Li.Co. in Brescia, Cremona, Como and Pavia. Maestro Colombo’s international orchestral engagements have included concerts with the Vidin Philarmonic Orchestra in Bulgaria and the Tirana Symphony Orchestra, his debut in Budapest with the Hungarian State Symphony Orchestra, in Mexico City with the Mexico City Philarmonic, in Frankfurt with the Museumsorchester Frankfurt and in Lisbon with the Teatro São Carlos Orchestra. 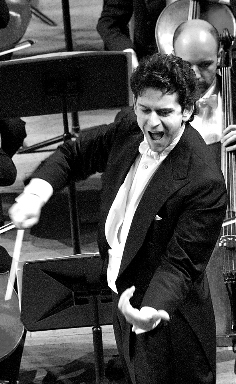 Other recent engagements have included the Orchestra Sinfonica Siciliana in Palermo, (Beethoven’s Concert n.3, Schubert’s Ninth Symphony) with the Orchestra della Toscana at Palazzo Pitti in Florence (Mozart, Beethoven), the Teatro Lirico di Cagliari on several occasions, the Orchestra di Roma e del Lazio at the Accademia di Santa Cecilia (Rameau, Fauré, Saint-Saens), the Orchestra Stabile di Bergamo (Mozart, Stravinskij, Mendelssohn), the Philarmonia Veneta (Debussy, Copland, Strauss), the Philharmonia Mediterranea Chorus & Orchestra (Pergolesi). He opened the 2003 season on the podium of the Orchestra Sinfonica di Milano “Giuseppe Verdi” and of the Orchestra Haydn di Trento e Bolzano, and conducting concerts in Verona (Filarmonici di Verona; works by Copland, Boccadoro and Mozart) and at the Teatro Sao Carlos in Lisbon.